Every year we begin a new year resolving to do (or quit doing) something and expect to be the game changer in our lives. For some it’s to workout, lose weight, cut out all carbs and sweets. For others, it’s a promise to save more money and get finances on track. Regardless of what you resolve to do there is a way to set yourself up for failure or success. The mindset we are in when deciding on a resolution determines it’s stickiness. 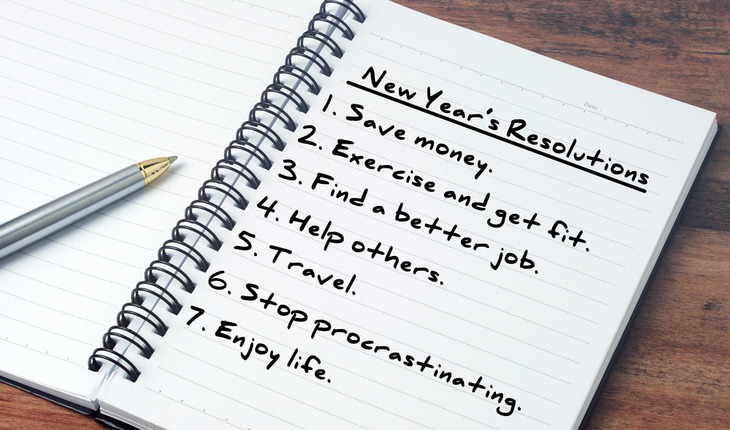 Here are my key insights on how to make New Year’s Resolutions that stick. Envision the end result and reverse engineer it. Neural pathways in the brain can be changed through a combination of visualization and aligned action. She encourages people to journal about what it is they want. Write it all out. “How would life improve? What would all the benefits be? Cut pictures out of magazines of what you want and post them to a wall (or if appropriate, the refrigerator). Get very clear on what you think you will feel like once you see results. Get clear on your triggers. Set yourself up for success by understanding what may potentially get you off track. Sticky resolutions come with planning. If you want to lose weight then begin with clearing out your fridge and cupboards of junk food. That in itself is an action that will tell your brain that you are serious. Get recipes and write out a new grocery shopping list. Writing plans, micro goals and ideas that serve the greater accomplishment you’re reaching for creates “buy in” from your brain. For the people resolving to save more money, evaluate when and why you spend. If you notice you spend $40 a week on coffee, think of alternatives. You don’t want to cut yourself off from anything cold-turkey. The brain doesn’t respond well to deprivation. It sends brain chemicals that signal displeasure which is what makes resolutions lose their stickiness. Shift to a possibility or curiosity mindset. Asking yourself, what can I do to save $5 per day invites in inspired thoughts and creative ideas. The reason why resolutions don’t stick is because people set the bar way too high and expect achievement way too fast. Think of every week as a win! Break it down into weekly chunks and train the brain to value quick accomplishments. The people who resolve to lose weight and get more exercise won’t stick to it if they don’t celebrate small milestones and try to do too much too soon. Resolve to lose 1 to 3 pounds per week. Do this by cutting out soft drinks or juices and drinking water instead. After 10 weeks you”ll be 20 pounds lighter with great skin just because you did one thing week by week until it became your new normal. Trick your brain by making it fun. Our language and self-talk is everything and determines if our resolution will fade or will become something we’re still doing in June. When someone resolves to change their diet, exercise and lose weight they already envision how difficult it is going to be so they are already dreading it before they started. However, shifting the brain to doing something fun that is in line with the goal gets you more committed. Create a playlist of great music to work out to. Look up recipes on Pinterest to build your new shopping list. When you do the advance preparation that is more fun, and take small steps towards building the new lifestyle to support your resolution, you’re setting yourself up for a win. Fuel your resolution with greater purpose worth committing to. If you want to resolve to save more money, it’s helpful to have a clear purpose for the money you plan to save. Resolving to save more money is vague making it hard to remain on track. Saving more money to take an amazing vacation or to purchase a home or car is something tangible you can stick to. “It’s common for people to commit to doing something when they connect it to a greater purpose beyond them or an experience they want to have. This explains why lifetime smokers can instantly quit when they learn they are pregnant. It’s not about them anymore. We see the man who is 75 pounds overweight lose weight when his daughter gets engaged. Whenever we can connect resolutions to a bigger purpose our minds get on board, and when the mind is all in, resolutions stick.